Max Scherzer is one of the unluckiest guys in baseball. On Wednesday’s game against the Marlins, Scherzer looked well on his way to a third career no-hitter, going seven innings without giving up a hit to a tough Marlins offense. He got his first six outs via strikeout, and only allowed one baserunner through a walk in the first inning. Despite a slightly high pitch count, Scherzer was on cruise control. Then the eighth inning happened. It started, in typical Scherzer fashion, with a strikeout of Derek Dietrich. The next batter, AJ Ellis, broke up the no-hitter with an infield single that came ever-so-close to being fielded by Scherzer. JT Riddle grounded out to advance Jose Urena, the pinch runner, to second. Two down, one to go. But it wasn’t to be for Scherzer. JT Realmuto reached on a howler of an error from stand-in first baseman Adam Lind. Scherzer then plunked Dee Gordon to load the bases, and bring up the King of Swing Giancarlo Stanton. Scherzer, his pitch count now over 115, reached back and tried to rocket a fastball past Stanton, but ended up putting it past his own catcher. Urena came in to score on the wild pitch. 1-1, game tied. We’re not done. Two pitches later, Stanton flared a hard-hit single to left, bringing home JT Realmuto to give the Marlins the lead (Dee Gordon was thrown out at home trying to make the score 3-1). In the span of twenty minutes, Scherzer went from throwing a no-hitter to being saddled with his fifth loss of the season. Dominant performances like this from Scherzer are becoming almost routine. Per Ryan Spaeder, Scherzer has taken a no-hitter into the sixth inning in 11 of his 82 starts with the Nationals — a ridiculous 13.4% rate. But how many of those starts go for wins? On four separate occasions including Wednesday’s game, Scherzer took a no-hitter into the sixth and the Nationals lost. Make no mistake: Scherzer doesn’t deserve those losses on his own stat line. The blame rests squarely on the Nationals’ front office for failing to acquire or develop a stand-out closer, let alone a competent bullpen. It’s not exactly breaking news that the Nationals’ bullpen is woeful this season. Their 5.04 ERA is 29th in Major League Baseball, better only than the 5.25 mark set by the Twins ‘pen. They have no set closer; six different relievers have converted saves this year. The Nationals have blown twelve saves this season, more than any National League team except the New York Mets. The closer-by-committee of Blake Treinen, Koda Glover, Matt Albers, Shawn Kelley, and whoever else the Nats might find just isn’t cutting it. At least Matt Albers finally got his first career save. The problems with a bad bullpen were plain to see on Wednesday. After Scherzer’s no-hit bid went up in smoke, he was floundering. His pitch count was over 110, and he began struggling with location. 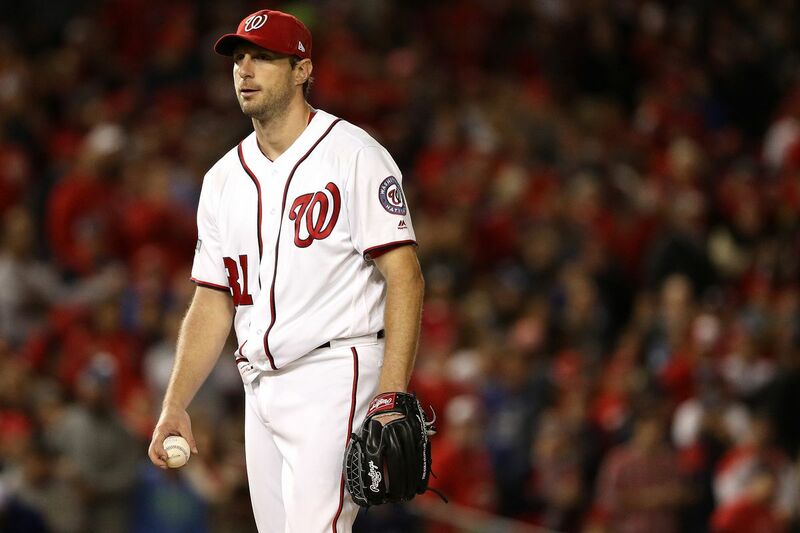 But Dusty Baker made the call that an out-of-gas Max Scherzer was better than any of the arms he had in his ‘pen. On Wednesday, that strategy failed miserably. On the wild pitch that scored Jose Urena, it was clear Scherzer had nothing left in the tank to give. But can any of us blame Dusty for not trusting his bullpen to get a crucial out when needed? This was not a case of “let him finish what he started,” or even an attempt to help Scherzer get the win. Baker simply didn’t have anyone to turn to after Scherzer reached the end of the line. Trying to plan a game with a bad bullpen is like playing 7-card stud with only 5 cards. You need to get as many innings out of your starters as you can before turning the game over to the ‘pen and praying. That strategy cannot work for a team with genuine World Series ambitions. The Nationals’ bullpen has thrown only 198.1 innings, by far the fewest of any team. As a result, the Nats starting rotation has thrown more innings than any other team. In an era of baseball where the bullpen is critical to postseason success–think about the Indians of last year, or the Royals the year before–the status of the Nationals’ pitching staff sends up major red flags for their chances. Andrew Miller and the Indians’ bullpen was a major part of their run to the World Series in 2016. All this could be mitigated if Washington can pick up a solid relief arm or two at the deadline. They’ve long been linked to the White Sox David Robertson, who has a 3.20 ERA on the season, but after sending so many prospects to them in the offseason for Adam Eaton you wonder what more the Nationals could offer to pry Robertson away from the South Side. Some other options could include Oakland’s Ryan Madson (2.63 ERA) or Padres southpaw Brad Hand (2.82 ERA), though he does have two blown saves on the year. If the Orioles become sellers perhaps Washington might even make a play at Darren O’Day or Zach Britton, though the Orioles seem to want to buy again. The crisis of the Nationals’ bullpen reached its tipping point with Scherzer’s no-no to oh-no yesterday. If Washington had anyone competent in the ‘pen that loss doesn’t happen, the starters get some much-needed rest, and Dusty Baker’s heart-rate stops spiking late in games. For the Nationals to avoid another embarrassing one-and-done this October, they need to find a closer or another strong reliever at the deadline. Wait a minute…this sounds familiar…weren’t we saying this about the 2015 Nationals? 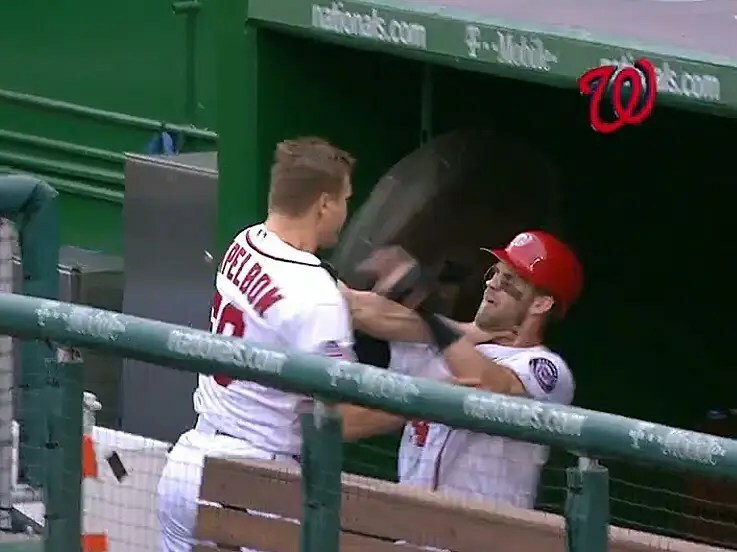 That’s right, they picked up Jonathan Papelbon at the trade deadline, and went on to miss the playoffs and start a dugout Fight Club. Dearth of a Nation: the Nationals failed to make the 2015 postseason after getting Papelbon at the deadline. Maybe this season will turn out better. If not, the Nationals’ front office may pass Congress as the most dysfunctional organization in the nation’s capital.